Why we’re running it: It’s the first in a two-parter: diesel vRS for three months, petrol vRS for three months. Which makes the better buy? I don’t have a dog or any children, my wardrobe removal business is yet to get off the ground and you’re more likely to see me swim the Channel in a tutu than voluntarily undertake any DIY task. Basically, I don’t have much need for an estate car. Yet on a couple of occasions recently, I’ve found myself putting the vRS’s spacious rear seats and enormous boot to good use. The first occasion was an early morning dash from home in Bristol to Bicester Heritage with three car-mad friends. We were going to the Luftgekühlt event – a gathering of air-cooled Porsches, basically – and the weather was grim. With the boot full of walking boots, jackets, umbrellas and dry clothes, the four of us piled into the car. Ben, in the front seat, thought the Skoda’s petrol engine sounded a bit like a diesel under half throttle openings and he wasn’t too impressed by the quality of materials inside the cabin, although he was so amazed by the Octavia’s traction away from slippery roundabouts he was convinced it had four-wheel drive. Riding in the back, meanwhile, was Adam, who said the ride was too firm for him to nod off (how my heart bled) and Ross, who was surprised at how much more leg room the Skoda offered than his BMW 3 Series estate. It’s enlightening to get a second, third or fourth opinion of a car you drive every day and it’s interesting to hear what other people pick up on. For what it’s worth, I thought the Octavia was in its element on that journey, although as we splashed away from Bicester Heritage after a day of Porsche indulgence I wished I was driving a 964RS rather than an Octavia vRS. The second occasion was Autocar’s Britain’s Best Affordable Driver’s Car shoot-out. No, the Octavia wasn’t in the contest, but it was being put to work as a support car. That meant it was loaded up with cases, bags, cleaning equipment and whatever else photographers and videographers need to do their jobs, while at other times it was used as a video tracking car. It didn’t miss a beat, although to be frank I’d have been alarmed if any of that had been troublesome. More revealing, though, was driving my car back-to-back with the likes of the Hyundai i30 N and Renault Mégane RS 280, which were in the BBADC contest. The route between Blyton Park and our hotel took in a brilliant stretch of B-road, thick with fiddly corners and quick bends and with a lumpy surface to boot. In terms of outright pace the Skoda didn’t give away much, if anything, to the hot hatches, but what the roomy estate couldn’t quite replicate was their sense of fun. The vRS is all about grip, composure and body control, but it doesn’t have the adjustability that makes a well-sorted hot hatch so engaging. The Octavia vRS doesn’t excel at any one task, but it is more than competent across a wide range of disciplines. It is the consummate real-world all-rounder. SOLID INTERIOR The cabin is proving to be hardwearing. After a few thousand miles it cleans up easily and looks more or less brand new again. MAP FRUSTRATION The sat-nav isn’t particularly clever. I can hack chunks out of the estimated time of arrival by taking short cuts. I’ve played around with the Octavia’s tyre pressures in a bid to improve its firm ride. They were 38psi but are now 34psi. Skoda recommends 39psi for a half-loaded car so I may be pushing it just a touch. Anyway, the ride is better without being transformed. We’ll see in the next few weeks if, by the law of unintended consequences, I’ve knackered something else. When the time comes to hand my Octavia vRS 245 back to Skoda, I will conduct a comprehensive breakdown of its running costs and have a look at how they compare with those of the diesel vRS that it replaced. For now, though, I couldn’t resist a quick fuel economy comparison. It goes without saying the diesel engine will achieve better fuel economy and therefore be cheaper to run, but the petrol motor is so much sweeter to use both in everyday driving and while on a bit of a run that I reckon most people reading this magazine would be happy to swallow a little more expense at the fuel pumps, although only if the difference is relatively slim. To get accurate and reliable miles per gallon data for the vRS 245, I brimmed its tank, drove it until the onboard computer was screaming at me to refuel, then brimmed the tank again. The total distance covered during the test was 375 miles, which included a fair amount of motorway driving, a good chunk of quick crosscountry stuff and a bit of around-town work too. At no point did I adjust my driving style with a view to nudging the fuel economy figure up a few points. Life is far too short. Anyway, the outcome was 33.9mpg, which is actually fractionally better than the trip computer’s estimate. The departed diesel vRS averaged 44mpg during its time with me, which is a reasonable improvement over the petrol model. I’ve run some numbers and for every 1000 miles covered, the petrol will cost £171 to fuel, whereas the diesel would cost £135. If you drive 15,000 miles per year, that’s a difference of £540 in favour of the diesel (taking the difference in price between the two fuels into account). Would you readily give up £45 a month just to drive a petrol, rather than a diesel? Yes, there will be other costs to consider, but £45 a month as a rough figure is a big enough sum that you would have to really dislike the lumpy, low-revving nature of a diesel engine to splash out on the petrol version instead. Personally, I think I would – particularly for a car that has a sporty edge to its character – but I get why somebody else might not. Ah yes, its sporty edge. I’ve already written about this car’s ride quality. It wasn’t specified with the optional adaptive dampers and, as a result, it rides a bit like a hospital gurney that’s been shoved down the Spanish Steps. On the motorway or out on the open road, I soon forget about the lumpiness of the car’s ride, but in town it really is a bit of a pain. It crashes heavily into potholes and sunken drain covers, finds ridges in the road surface that you didn’t know were there and thumps hard over bumps. If the road surface is really poor, you get out even after a short drive feeling somewhat beaten up. It is pretty good to drive on a twisty B-road, though. Compared with the Volkswagen Golf GTI that it shares so much with, the Skoda does feel a bit lazier and less agile, but you would have to expect that of an estate car. Given its size, it is quick along a road and reasonably good fun to hustle too. The electronically controlled VAQ differential really hauls the front end away from corners and the steering is precise and connected enough that you can place the Octavia where you want with real confidence. Still, none of that goes a particularly long way to making up for the ride quality. We’re not discussing a supercar here, are we? I repeat my advice from earlier reports: if you’re considering a vRS 245 as your next car, £860 on Dynamic Chassis Control is money very well spent. COMFORTABLE CRUISER Ride issues notwithstanding, I never once remember feeling achey or numb at the wheel of the Octavia, even after a long drive. LACKLUSTRE AIR-CON In hot weather (by UK standards) the air conditioning isn’t the most effective system I’ve come across. My three-month custodianship of the Race Blue Skoda has drawn to an end. I doubt I’ll miss the Octavia vRS 2.0 TDI too much, but only because it has made way for a shiny new model. The lasting impression from those three months at the wheel of Skoda’s diesel vRS is this: when government legislation makes diesel cars unduly expensive, and when it knackers their residual values – which seems to be the direction we’re heading in at the moment – lots of drivers, myself included, are going to sorely miss mid-40s to the gallon and virtually a 500-mile range. What the diesel vRS did well – and I appreciate there are plenty of other cars out there that manage much the same thing – was combine that sort of fuel economy and range with strong straight-line performance and a broad spread of dynamic competencies. Without really excelling at one thing in particular, my now departed Octavia vRS, which was equipped with a DSG dual-clutch transmission and four-wheel drive, had just about every base covered. It was reasonably fast, competent along a twisty road, comfortable and refined on the motorway and, if you swapped the summer tyres for winter rubber, I’ve no doubt it would be pretty indomitable in the very worst of the colder months too. But, alas, it has been decreed by the powers that be that diesel is the fuel of the devil and we must all move away from it post-haste. Which completely ignores the fact that every diesel car on sale today must now meet EU6 emissions requirements, meaning they’re hardly any worse for local emissions than a comparable petrol engine while being far better in terms of overall CO2 emissions. For the record, we at Autocar maintain that diesel still has its place, particularly for bigger cars and for drivers who cover more than 15,000 miles each year. Our car has now been replaced by a vRS 245, the newest model in the Octavia performance range, which was introduced just last year. As well as being the latest vRS with the most recent chassis tuning, the 245 is also the most powerful vRS so far. My new car looks the part in Moon White with black accents – actually, parked next to the Race Blue Octavia, it immediately made the diesel car look somewhat old-hat – and it arrived with just 458 miles on the clock. As I’ve said before, the new car is diametrically opposed to the old one. It’s an estate rather than a hatch and a petrol rather than a diesel, of course, but it’s also a front-wheel-drive manual car whereas the one it replaces was a four-wheel-drive DSG. Over the next couple of months, I’ll have plenty of time to work out which exact configuration works best for the Octavia. What’s more, the new car doesn’t have Dynamic Chassis Control, whereas the old car did. I noticed that particular omission within the first half mile. With no adaptive dampers, and therefore no Comfort suspension mode, the 245 has a tough and unsettled ride. It isn’t unbearable, but it can be irritating. Take it from me: if you’re contemplating a vRS 245, make sure you spend the extra £860. What you really need to know about the 245 is that it borrows the 242bhp 2.0-litre turbo engine and electronically controlled mechanical differential from the Volkswagen Golf GTI Performance. Apart from making it the fastest vRS yet, that drivetrain should also make the 245 the most entertaining hot Octavia so far too. More of which in a moment. The 245 comes so loaded with kit as standard that there are just two options fitted to this test car. The first is the metallic Moon White paint at £400 and the second is a spacesaver spare wheel, which costs the grand sum of £105. The total cost of this car is £29,805. The standard specification includes 19in wheels, rear parking sensors, a touchscreen sat-nav, electric seat adjustment, cruise control, climate control, Bluetooth, LED lights, heated seats and plenty more besides. Apart from the Dynamic Chassis Control that I’ve already mentioned, the only thing I’m missing so far from the Race Blue car is wireless phone charging (although it’s only any good on long journeys because it charges a phone at such a dismally slow rate). How does this car compare with the diesel version? What’s clear right away is that it’s much more fun to drive, with tauter body control, sharper responses to steering inputs and a far sweeter, more revvy engine. Actually, compared with the 245, the diesel doesn’t feel particularly sporty at all. The petrol model’s differential is brilliantly effective, too, especially in its more aggressive mode, when it drags the car away from corners with an energetic, terrier-like enthusiasm. Over the course of this long-term test, I’ll have plenty of opportunity to compare running costs, particularly fuel economy, between the two models. So far, it looks as though the petrol vRS averages something like 33mpg, although with the car not yet properly run in, I don’t want to judge it too harshly. The all-important first impressions are generally very good. I reckon a 245 estate could just be the perfect car for anybody who has outgrown a conventional hot hatch but still wants something with a bit of performance and a taste for deserted back roads. My Race Blue Octavia vRS will soon be making way for a Moon White one. The replacement vRS is different to the outgoing one in just about every conceivable way. Instead of being a diesel, four-wheel-drive hatch with a DSG transmission and Dynamic Chassis Control, it’ll be a petrol, front-wheel-drive estate with a manual gearbox and passive dampers. 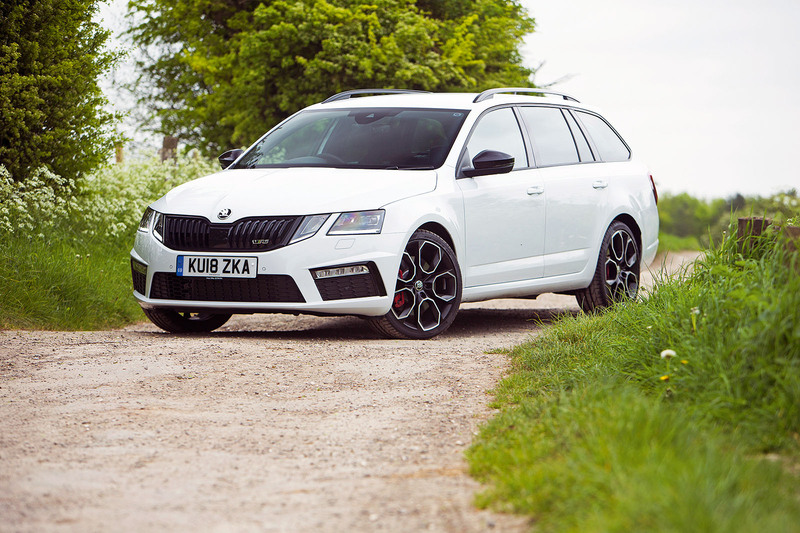 Between them, they represent the two opposing ends of the Octavia vRS model range. As I write, I still have some time with the blue car and recently I had my most enjoyable drive in it so far. I was on my way to a photo shoot in Berkshire on a stretch of road that I know far better than someone who doesn’t live in Berkshire should. The B-road in question is one of the smoothest you’ll find anywhere on our fair isle. Rather than jinking and darting this way and that like a demented housefly, the road just meanders along, flowing gracefully through the low-set hills. In short, it was exactly the type of road that really flatters the vRS. The surface was bone dry and the Pirelli P Zero tyres were clawing a consistent and predictable level of grip out of the surface, while the perfectly weighted steering allowed me to position the car exactly where I wanted it. Those two virtues alone gave me all the confidence I needed to thread the car along at a good, but not irresponsible, speed, one flowing corner feeding seamlessly into the next. On a stretch like that, the Skoda really works. What it doesn’t cope with so well are sections of road featuring one tight corner after another, the sort of road that best suits very light and nimble cars. You can feel the weight of the Octavia in second and third-gear bends, and you sense it struggling for front-end grip. The same is true of undulating and cresting roads, which make the car feel floaty and loosely controlled no matter which driving mode you choose. It’s a pity, then, that roads like that one in Berkshire really aren’t very common in the UK. That’s why the vRS will never be much of a back road thriller; the roads you find in this country mean that, most of the time, it just feels a little out of its depth. In many other ways the Octavia vRS continues to be a very straightforward car to live with, proving unfussy, undemanding and comfortable. That warning message on the instrument panel exclaiming ‘Error: workshop!’ hasn’t reappeared since I first mentioned it back in May, so the car been close to faultless for the three months it’s been with me. It hasn’t been a breathless, steamy dalliance, but sometimes you just want a car to be, you know, a car. I’ve also come to appreciate the ‘Simply Clever’ features that make a Skoda a Skoda. They’re little flourishes that you wouldn’t necessarily notice during the first few days of ownership. For instance, the small rubber grips in the cup holders which allow you to unscrew a bottle cap using one hand. It’s a feature our editorial director, Jim Holder, is also fond of in his Kodiaq. Then there’s the neat parking ticket holder that’s tucked into the windscreen, plus the various hooks, straps and little moveable barriers in the boot that stop your eggs from flying out of your shopping bag and Humpty Dumpty-ing themselves all over your walking boots. You’ll see why I thought the warning below was a serious one. The car seemed fine, though, so I ignored it and carried on. I did go straight to my local Skoda dealership, which confirmed there was nothing amiss. Since then, the message has returned just once, but quickly vanished. If it returns again, the car will get a proper health check. You’ve just landed at Gatwick airport on a soggy, misty evening in March. Your flight was delayed by a couple of hours and you still have 140 miles to drive home. You’re moody and irritable. It’s at times like these that all you want from your car is comfort, a level of effortlessness, plenty of fuel range – there are few things more frustrating than having to stop at a fuel station when all you want is to get home – and for the Bluetooth to just work. That’s exactly what the Octavia vRS does so well. As I said in the first report, it’s an undemanding car. The seats are comfortable and supportive in all the right places, the ride is composed enough, it’ll do around 450 miles between fuel stops and the infotainment stuff is all pretty much faultless. It also has enough accelerative punch to nip through traffic in town and overtake slower vehicles out on the open road, and it’ll return 40-something miles per gallon almost regardless of how hard you drive it. Now, there are lots of cars at this price point that do all of the above. The list of cars that do all of the above and also make you grin when you start giving the tyres some pain on a B-road, though, is an awful lot shorter. The vRS, I suppose, is all about breadth of ability. Let’s be real, though: it’s no Volkswagen Golf R on a country road. It feels heavier, less agile and slower. The damping isn’t as brilliantly resolved and the steering not quite as sharp. What’s important, though, is that its chassis has enough substance about it that it doesn’t collapse huffily into a mess of understeer and comedy body roll on a twisty road. It holds itself together, which means you can have fun punting it along. You can also cover ground at a decent pace. I don’t think that particular set of attributes will ever make you really fall for a car. That sort of car is like a good smartphone: you respect it because it makes your life easier. I’ve been wondering if this car’s four-wheel-drive system is actually worthwhile. You’ll pay a £1490 premium over the front-wheel-drive model for it. Sometimes, I think the 4x4 vRS really is the better car, like when pulling out onto a fast-flowing, wet roundabout. The two-wheel-drive car would either trigger its traction control and not go very far, or light up its front wheels and miss the gap in the traffic altogether. This model, though, leaps forward without any fuss or hesitation, so you need only a narrow gap in the flow of cars to get yourself moving again. That, of course, is a very specific scenario. The rest of the time, I’m simply not aware the car is four-wheel drive. Several weeks ago, however, when the vRS had only recently arrived with me and the not-so-fearsome Beast from the East was due to cover much of the UK in a blanket of snow, I cancelled all prior arrangements and instead used the Skoda to get from Bristol to Heathrow airport. The flight was an extremely important one that I absolutely couldn’t miss (two weeks in the sun, you see). As it happened, the snow didn’t actually arrive until the day after I flew, but the sense of security meant the journey was much less fraught than it might have been. Of course, that sense of security might well have been a false one because the vRS was not on winter tyres. But it made me think: a four-wheel-drive Octavia vRS with winter rubber would be pretty much perfect for the UK in our colder months. It would be sure-footed on a wet or cold road, and it would cope with a decent snow dump too. EASY INFOTAINMENT Lots of car infotainment systems are baffling and tricky to navigate, but the Skoda’s is as clear as day. Its screen icons are usefully big too. INSISTENT WARNING When the windscreen washer fluid level is low, the warning chime goes off every few minutes. Very annoying. During the 1500 or so miles I’ve covered in the Octavia vRS, I’ve averaged about 43mpg. That’s short of the 55.4mpg Skoda claims for this diesel model, but it’s not too bad given the punchy performance. Fuel consumption hovers around the mid40s regardless of how I drive the car. Would I trade some of that efficiency for a sweeter, higher-revving petrol engine? More on that next time. All things considered, this is a slightly strange time to be taking delivery of a new diesel car. Certainly, far fewer people are doing so now than at any point in the past few years. The stats show that sales of new diesel models were down in December by 31% year on year, the result of a persistent and, we reckon, wholly unreasonable character assassination of the black stuff both in the mainstream press and at the hands of the government. Just a few days ago, new tax rules were implemented that effectively make all new diesel cars more expensive to buy. For the highest CO2 emitters, the cost of the first year’s road tax will have leapt up by £500. For other diesels, the increase will be as little as £20, and the new regulations relate to that first year only, but the message from Whitehall is clear: diesel’s days are numbered. The unintended consequence of the government’s efforts to discourage us from buying diesels is that overall CO2 emissions are creeping up. New car buyers are favouring petrol-engined cars in this post-Dieselgate era and, typically, a petrol car emits more CO2 than a comparable diesel one. Several cities around the UK are pondering banning diesel cars, too, each of them citing diesel’s harmful NOx emissions, which have been closely linked to respiratory illnesses. That’s pretty tough to argue with. The very newest diesels are just about as clean as a typical petrol engine, though, so forcing buyers away from such models achieves nothing at all. Apart, perhaps, from giving a vague impression that something is being done. For all these reasons, we at Autocar think diesel still has an important role to play in the medium term, which is why this Skoda Octavia vRS 2.0 TDI is joining the long-term fleet. Consider it a flag-waving exercise for compression-ignition. This isn’t an entirely conventional long-term test, though, because after three months we’ll be chopping this car in for a petrol model. We absolutely do want to stand in diesel’s corner at a time when it’s being unfairly demonised, but if we come to the conclusion six months from now that a petrol Octavia vRS is the better overall proposition, that’s the one we’ll be recommending. Over a few thousand miles, we’ll get a good insight into the buying and running costs of each model, too, so we’ll know which one works out cheaper in the long run. This particular car, resplendent in Race Blue metallic, is a fourwheel-drive model with the DSG dual-clutch automatic gearbox. Its standard list price is £28,700, but the 19in wheels (£655), Canton sound system (£505), Columbus sat-nav (£1060) and the essential Dynamic Chassis Control (£860), plus a couple of other extras, lift the overall price to £32,795. The engine is a 2.0-litre diesel with 182bhp and 280lb ft of torque. Skoda claims 55.4mpg and CO2 emissions of 134g/km (which, incidentally, means the first year of road tax costs £300 more today than it would have done a week ago). When this car is replaced by the petrol version – the new vRS 245, the most powerful vRS yet – it won’t just be the fuel type that changes, but more or less the entire configuration. Rather than a four-wheel-drive hatch with a dual-clutch ’box, the petrol car will be a front-driven estate with a manual transmission. That way, we’ll know for certain exactly what it takes to get the best out of the Octavia vRS. First impressions? Mostly very positive. It feels like an effortless, undemanding car, the sort that slots neatly into your life. There’s acres of space in the cabin. The diesel engine is strong and gutsy, with a usefully wide powerband. It’s hardly a thrilling four-pot, though, and it is quite noisy, particularly when cold. The DSG ’box, meanwhile, is very good, although it does change down too often when you apply a little more throttle, perhaps to get past a cyclist on a busy urban street, when it could just lean on the engine’s big wedge of torque and spare you the sudden downchange, thrash of revs and jolty burst of acceleration. For the most part, it’s very comfortable, too, thanks to the optional DCC adaptive dampers that our road testers have found to be so important. My only criticism of the ride quality is a slight but constant patter at motorway speeds. I suspect those very big – and presumably rather heavy – 19in wheels are the cause. It’s as though the hefty, oscillating mass on the end of each limb is just a little too much for the springs and dampers to keep control of. In the cabin, it doesn’t feel like a brittle or unyielding ride, but more like there’s one unbalanced wheel. Everything else? I’ll report back in more detail next time but, a couple of hundred miles in, I would characterise the Octavia vRS – in this specification, at least – as a hot hatch reimagined as a grand tourer. It’s less tightly wound than the VW Golf GTI with which it shares a platform; more laid back. That should make for a pretty decent everyday car, I reckon. Officially CO2 emissions are going up, based on a crude calculation of sales x posted NEDC figures. In reality, lots of diesel cars that claim an average 50mpg + are doing much worse than that bumping around suburban Britain. Fewer people choosing diesel SUVs for short commuting duty is a good thing. Drivers who do big mileage will still choose diesel. ... This car looks like it has down syndrome. Deal breaker. But it is lucky it has not got your personality. The problem with your attempt at a personal attack is that cars don't actually have personalities. Keep trying, champ. Personification directed back at me may have been successful. Used correctly, it can be an effective comedic device. Something like, "At least it doesn't have your face, Recliner, you hideous munter". Did you see what I did there? That works, because cars do have a face, of sorts. I will watch this road test with interest. The really big difference between this and the petrol you will have later is depreciation . A manual, front wheel drive petrol has much less value to lose. Add that to the lack of demand for a diesel at trade in, and the case for this version just won't stack up. People really only ever chose diesel to save money. It doesn't work any longer, unless you drive the car a massive distance before swapping it. Add in that the petrol version will be more fun, and to me it's case closed before you even start. ... but you've chosen hens eggs and swans eggs. Having owned hatchback and estate cars of the identical model even with the same engine and gearbox, I can categorically state that they are different. For the Ford Mondeo the estates were noisier and more wallowy. If you add in changing the engine, transmission and fuel, you don't have a comparing, you have a contrast between two completely different vehicles that happen to have the same badge on the bonnet. This feels more like top gear - boys playing with toys - than any serious comparison. I'm disappointed. I had thought I was going to read something useful; maybe a real comparison of similarly specified cars merely with differently fuelled engines. difference is mate , you can eat hen eggs cant eat swan eggs , against the law!!! Get near them they break your arm mate! Save yourself about 9k by buying a year old Passat 190 GT estate.